Based on the dimensions worked out in the last two posts, here are some renderings of the interior and exterior of the Chamber of Hewn Stone. 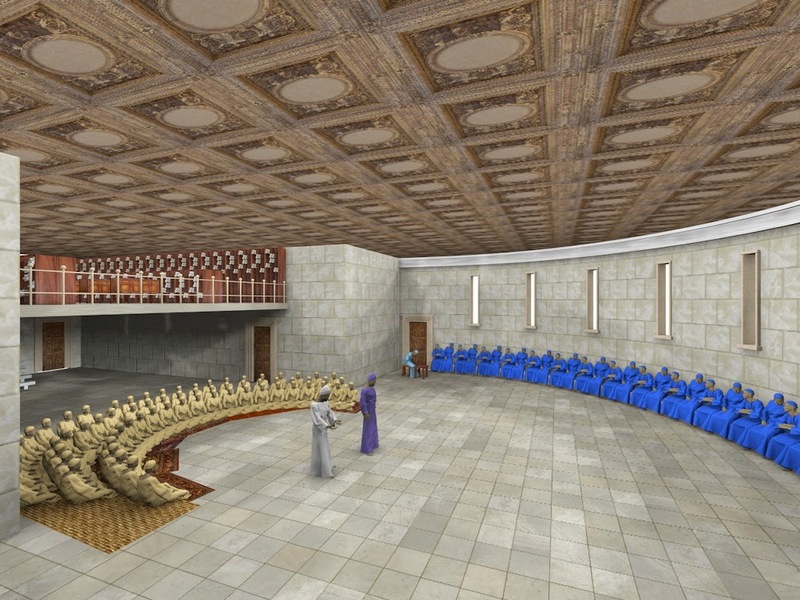 In the first picture we are looking at the unconsecrated half of the chamber where the court would meet. 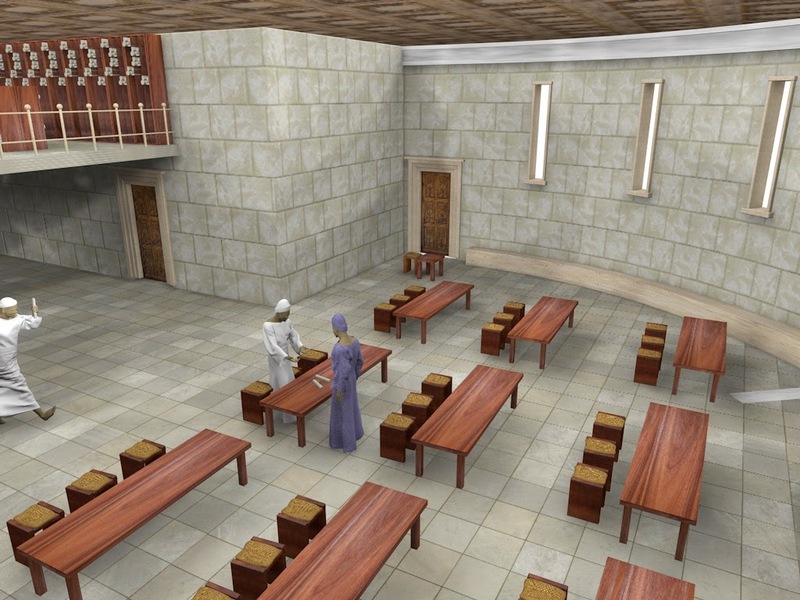 A convening of the full court for judicial proceedings was rare, and most of the time the court was involved in confirming the pedigrees of Kohanim and Leviim who came to work in the Temple. I have set up tables and chairs for this purpose where candidates would present themselves before the judges. A Kohen confirms his pedigree with a judge of the Sanhedrin court. 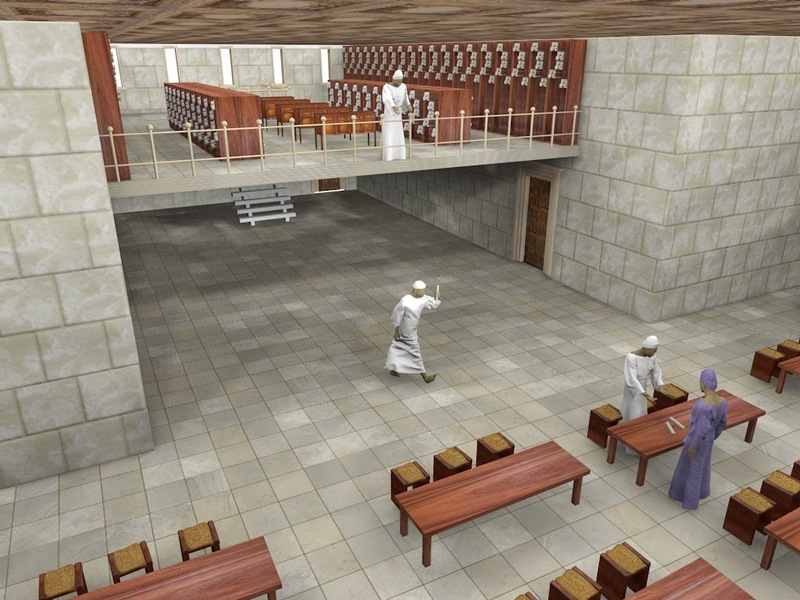 The southern half of the chamber had two floors, and I imagine that this was where all the court records and family trees of the Kohanim and Leviim were kept. Since this half was consecrated no sitting was allowed here. Unlike the Hall of the Fire, for example, no indicator was used on the inside of the chamber to mark the border between the consecrated and unconsecrated halves, although in my design it turns out that the edge of the upper floor provides a convenient visual indicator of where the border lies. The door on the right side of this picture leads into the chamber used by the Kohen Gadol during the week prior to Yom Kippur. On the occasions that the full court did meet, the tables and chairs would be cleared away to make room for the litigants and to ensure that all those present could see each other. As was the case in the smaller courthouses, three rows of 23 students each sat before the court on the ground. Seen seated at the end of the semicircle of judges is one of two court stenographers who would record all of the proceedings. Just behind him is a door leading down to the Temple Mount. The Great Sanhedrin court meets in the Chamber of Hewn Stone. 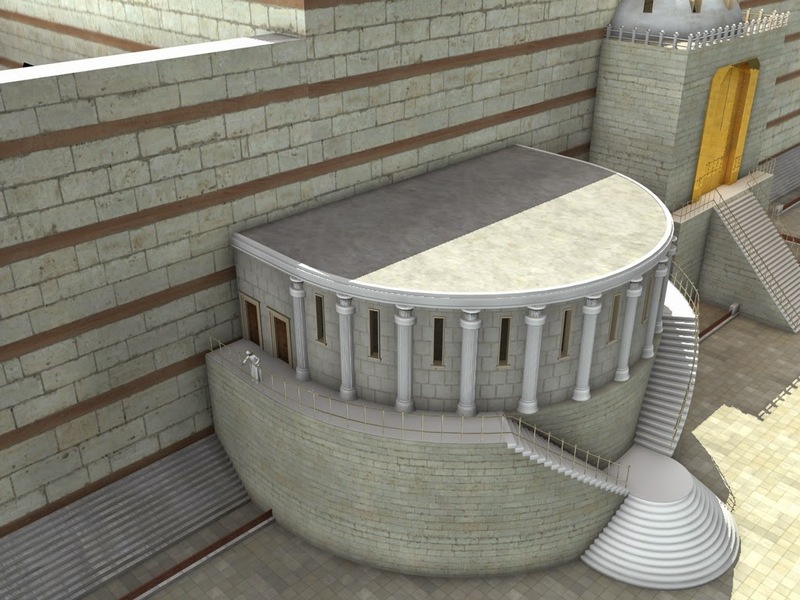 The floor of the Chamber of Hewn Stone was even with that of the main Courtyard and the part of the chamber which extended beyond the Courtyard walls to the north stood 16 amos (24 feet) above the Temple Mount. It was supported by a large basement which was either filled in with dirt or may have been hollow inside for use as some other chamber. Northern half of the Chamber of Hewn Stone. Just behind it is the Hall of the Fire. 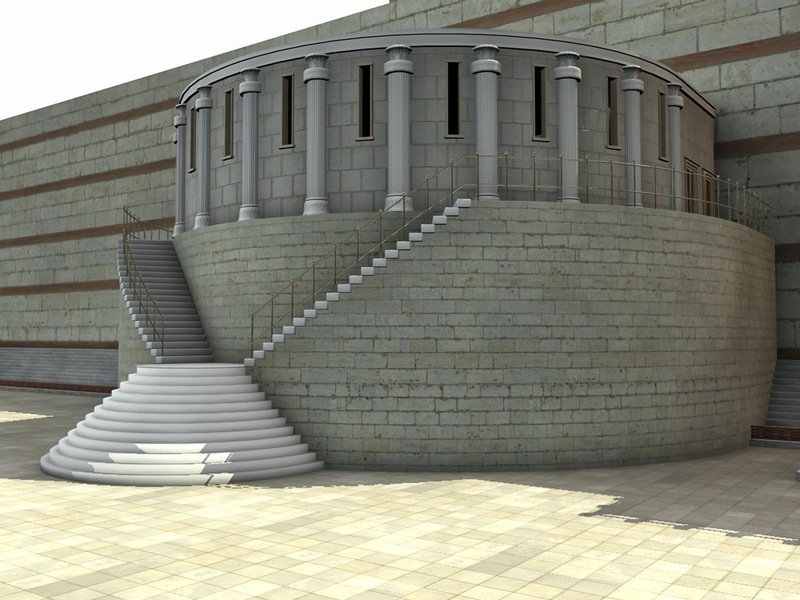 When seen from ground level this structure indeed resembles "a large house upon a second story" (Rashi).